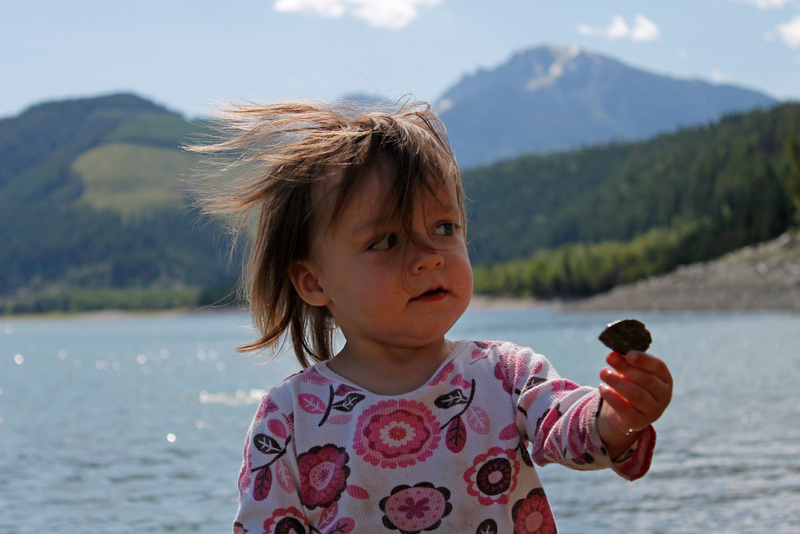 I took my daughter on our first road trip together to meet friends at Kinbasket Lake Resort, nestled in the Rocky Mountains. We stayed on Shuswap Lake on our way up and at Lac Le Jeune Provincial Park near Kamloops on the way down. Lakes: we enjoyed swimming in Shuswap Lake, Kinbasket Lake and Lac LeJeune. Kinbasket was pretty chilly when we went (early july) but we were told it warms up quite a bit in August. 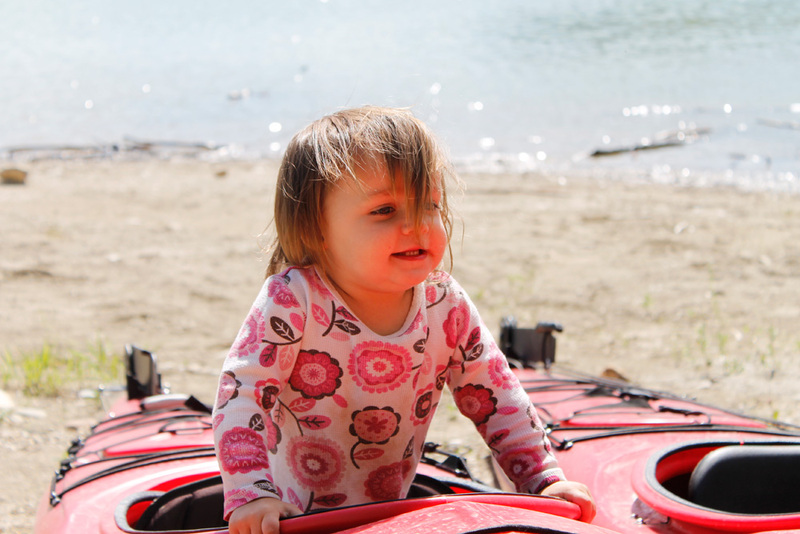 Friends brought sit on kayaks that the kids could use and that was lots of fun close to shore. Our friends also brought a boat – the lake is huge and motorized boats are allowed. A canoe would have been fun too. Trying a kayak on for size. Rogers Pass National Historic Site is very close to Kinbasket lake in Glacier National Park. This high mountain pass cuts through the Selkirk Mountains and is used by the Canadian Pacific Railway and the Trans-Canada Highway. The pass is significant because it is a shortcut that connected British Columbia to the rest of Canada by rail. Even sitting in the parking lot is enjoyable here as the mountain views are breathtaking. We also did a quick tour of the Rogers Pass Discovery Centre, featuring a theatre and exhibits which share some history of the construction of Canada’s first trans-continental railway. Hiking & Trails: Glacier National Park has a large network of trails. 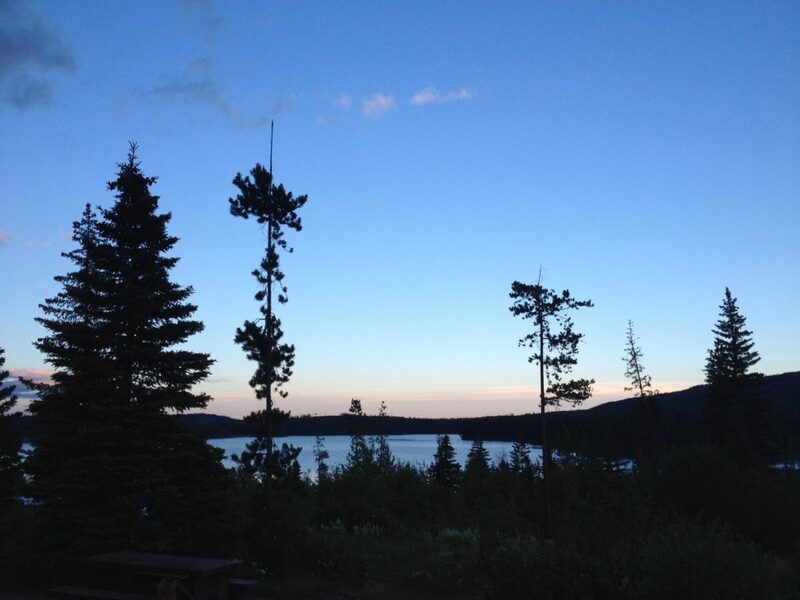 Kinbasket Lake Resort is also a great starting off point for day hikes. Playing! My friend brought lots of crafts, some toys and bubbles, including a bubble machine! which were all big hits. The older kids also organized a talent show which kept them entertained while planning, and provided some fun for the adults too at showtime. Craft time keeps everyone entertained. Cooler baths! My friend introduced us to the art of bathing little people in a cooler. This was something we took home with us and is still a fun outdoor activity in the summer. 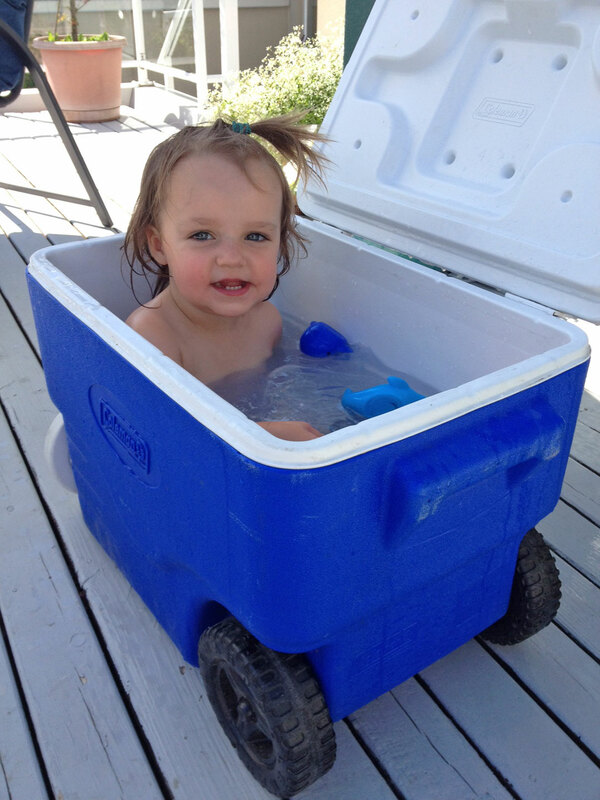 Cool bath hack – fill up a cooler! 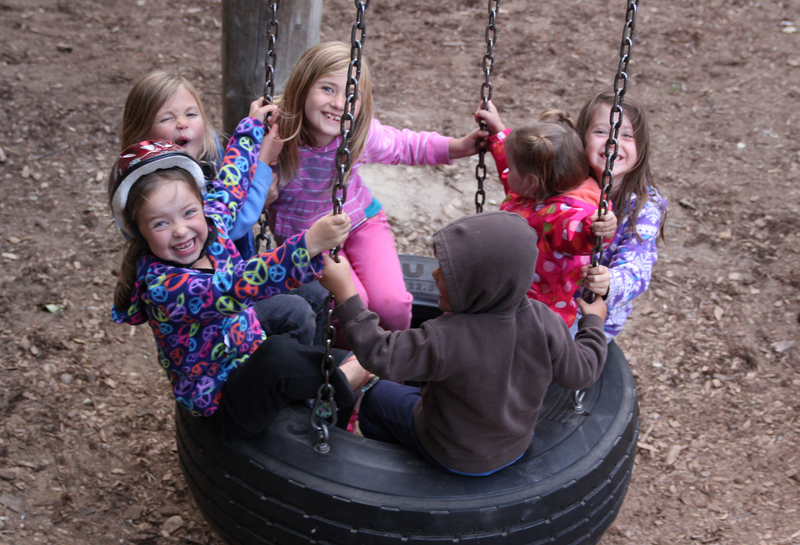 The playgrounds in all 3 campgrounds we stayed at were also highlights – sometimes all it takes is a simple swing or slide to lift everyone’s spirits. The jumbo swingset at Kinbasket Lake was a hit. 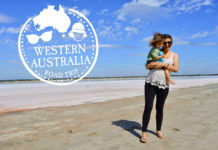 I remember listening to a Raffi cd on repeat – it was great to have some music that kept my daughter entertained on the long stretches of the drive. 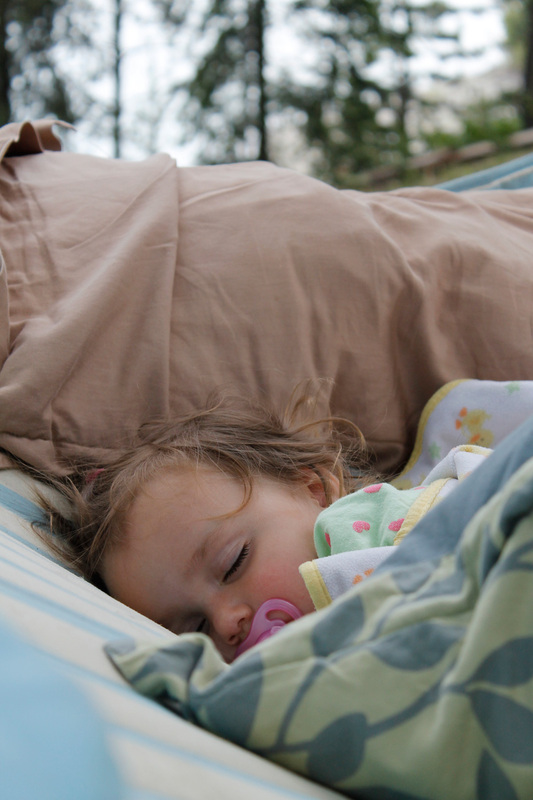 My daughter napped in a hammock my friend had brought – this turned out to be a lifesaver as she had a hard time napping in the tent and I didn’t have room to bring our stroller. I loved watching her peacefully sleeping between the trees. Catching some zzzz’s in between two trees. All our meals on this trip were camping meals. One of my favourite meals was halibut fried with garlic scapes and zucchini – we brought a frozen piece of fish that helped keep the cooler cold and by the second night it was perfectly thawed and ready to cook. I planned simple one-pot meals like oatmeal for breakfast and boxed Annie’s noodles for lunch, as well as peanut butter sandwiches and fruit. Everything seems to taste better when you’re camping so I just kept it simple, especially since I was only cooking for myself and my 2 year old daughter. We also did some shared meals – one of the many benefits of vacationing with friends. We live on Vancouver Island so we ferried over to mainland British Columbia, had a pit stop at my Mom’s in North Vancouver and then hit the road. I had written down names of a few provincial campgrounds to stop at. Making good time I decided to go past the first option near Kamloops and head towards Shuswap Lake. After a long drive some running around is a must! 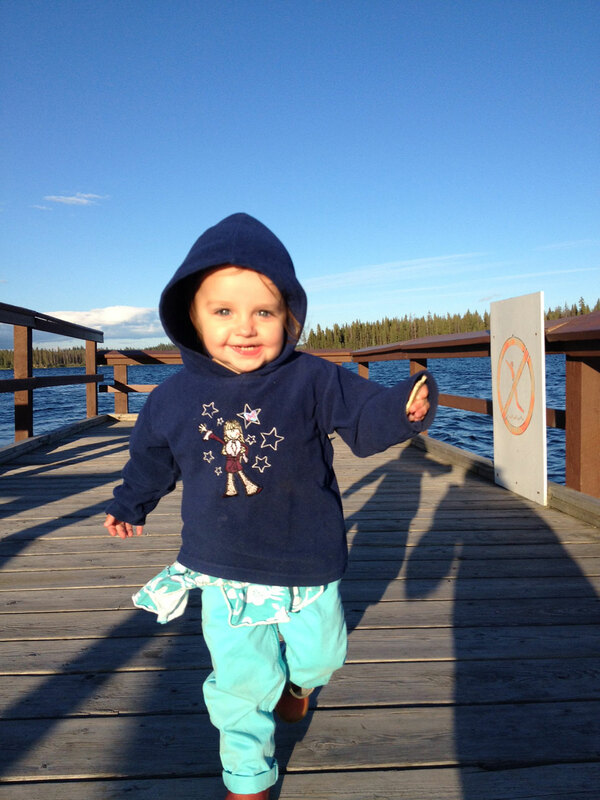 Dock at Lac Le Jeune. As dusk was approaching and after having missed the provincial campgrounds at Shuswap I was relieved to find a private campground called Pierre’s Point Campground. 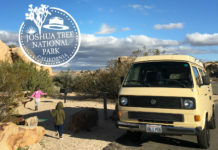 Google reviews include: “Train runs beside the campground every 20 minutes to an hour.” “RV’S are crammed together like sardines!” – While both these comments are accurate we had a great stay. Since we were tenting, we got a primo lakeview tent site, and fell asleep in our cool mesh walled tent to the views of the dark pink sky over the lake. The train did wake me up a few times however I was tired from driving and didn’t mind too much. There was also a decent playground which provided some well-deserved playtime for my awesome little traveller. I also remember a decent sandy beach we had a short swim in and looking at their website they have lots of other entertainment. A girl and her rock at Kinbasket Lake Resort. 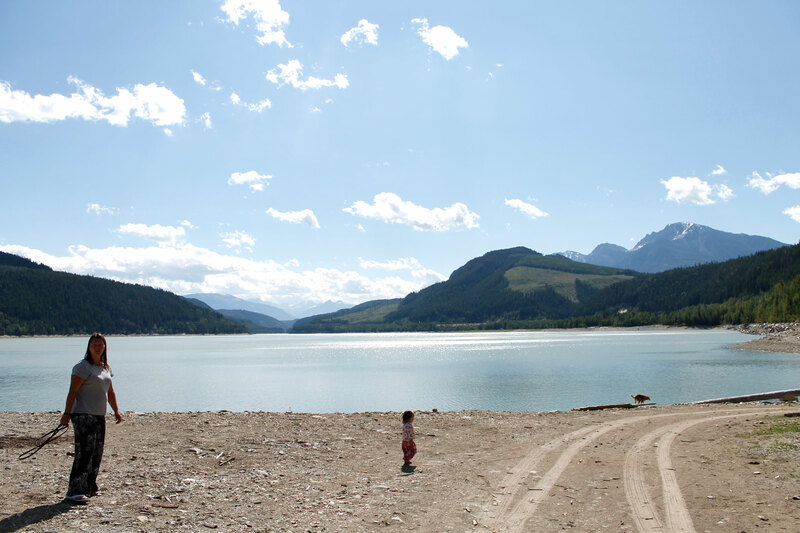 Kinbasket Lake Resort is the only campground on 260 km long Kinbasket Lake, located near Golden and Revelstoke BC. 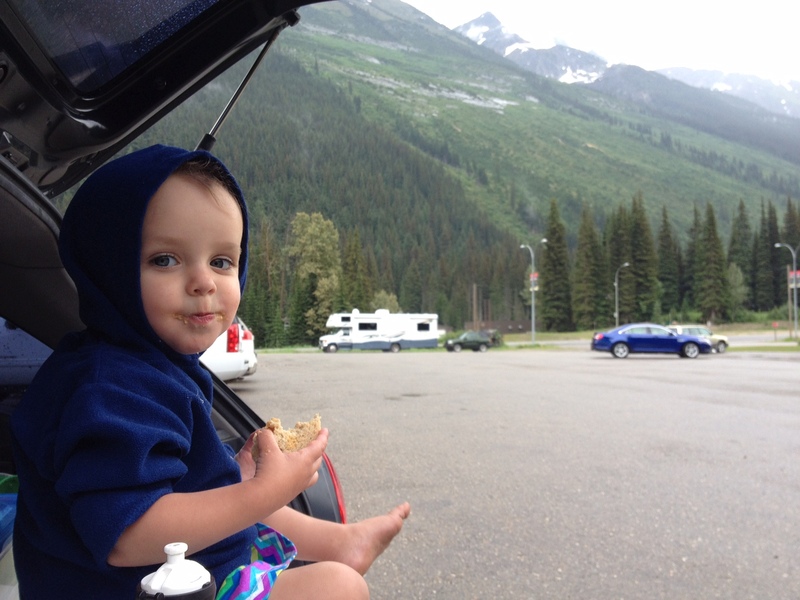 It is a short drive from Rogers Pass and offers cabins RV sites and tent camping. The rustic resort is very family oriented – it feels safe and contained, and there is a great playground with swings for all ages. The glacier fed lake is a beautiful icy turquoise colour – it was cool, but swimmable in early July and apparently gets up to 21-23 degrees at the beginning of August. It is a great spot for fishing, boating and other fun lake activities. 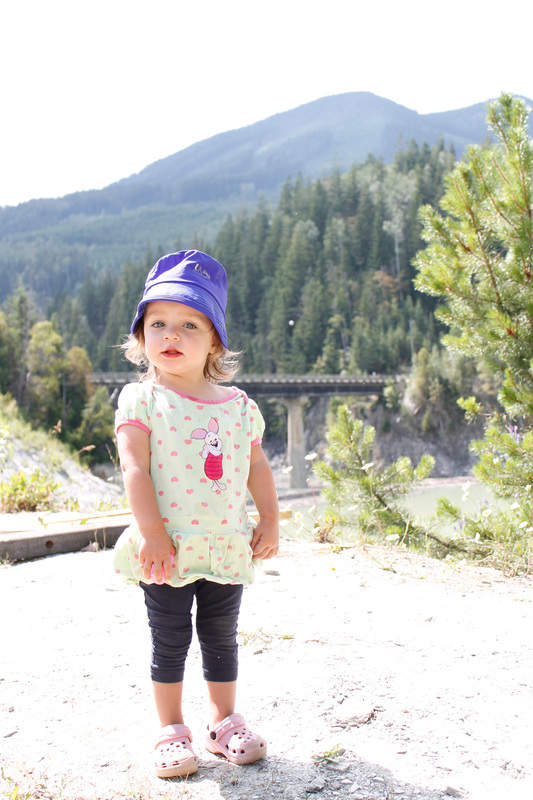 I only stayed 2 nights but if I had realized how long a journey it was going to be I would have stayed a few more days and brought a toddler backpack to do some hiking on the trails at the campground, as well as in nearby Glacier National Park. The campsites were a good size and the bathrooms and hot showers were great. A bonus was that they have a dish-washing station which eliminated the awkward washing in a bucket on the picnic table technique. Note it is a 4km dirt road down from the highway (made enjoyable with encouraging signs :D) but my hatchback car made it no problem. There are also trains running by here, but not as close or as frequently as in Shuswap. 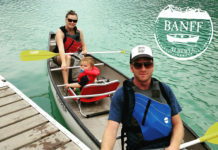 Overall this is a great camping resort to stay at with kids. Kinbasket Lake is all about the location and the scenery. 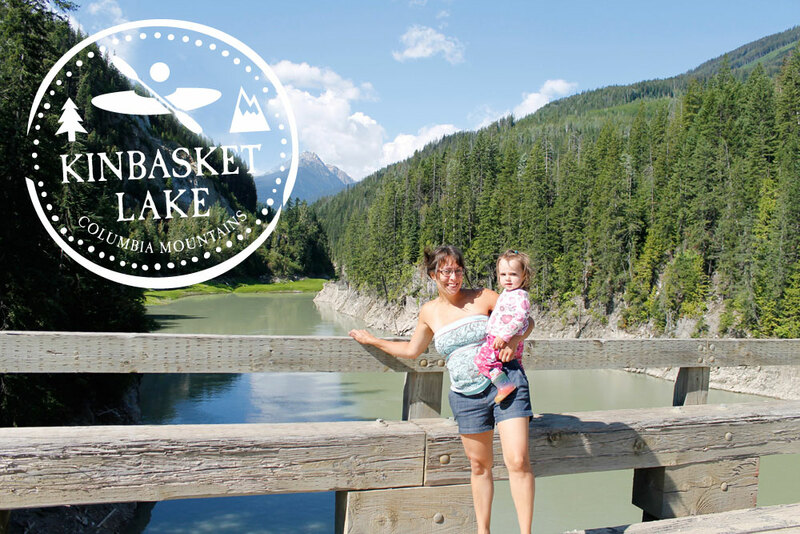 If you want to experience breathtaking views, a gorgeous lake and as much peace and tranquility as can be found on holiday with your kids, and you don’t mind a long drive, add Kinbasket Lake to your list. Great lake view from the top of a playground slide at Lac Le Jeune. 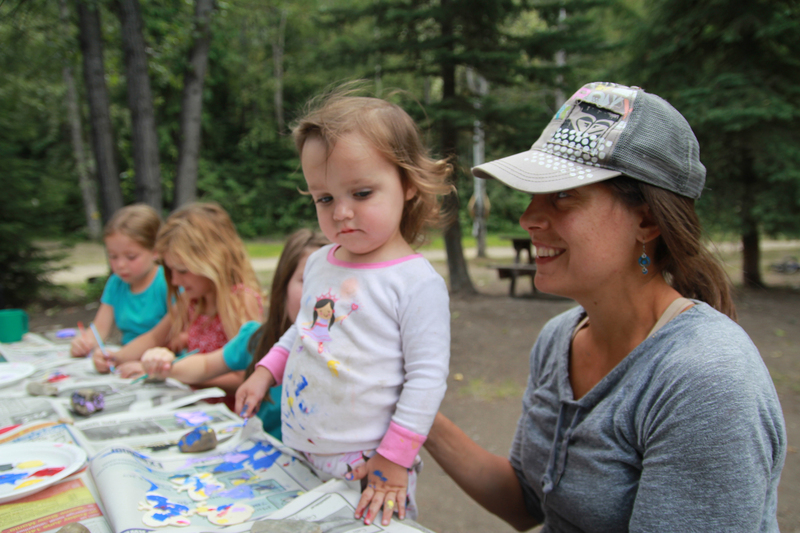 Lac Le Jeune is an exceptional example of British Columbia’s amazing Provincial Park system. 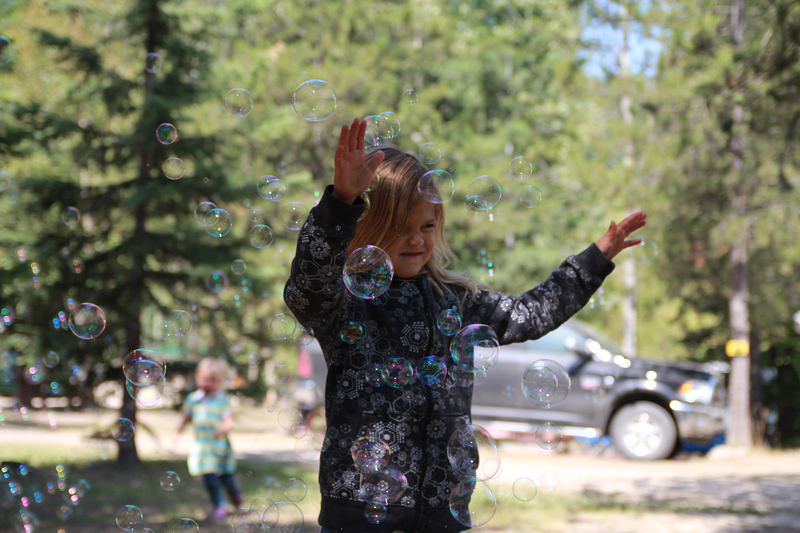 After a long drive from Kinbasket Lake we were overjoyed to spill out of the car into our wildflower filled campsite at Lac Le Jeune. In the short 1 night stay we enjoyed a family friendly educational talk about owls, played on the long dock, and blew off some steam at one of the playgrounds. 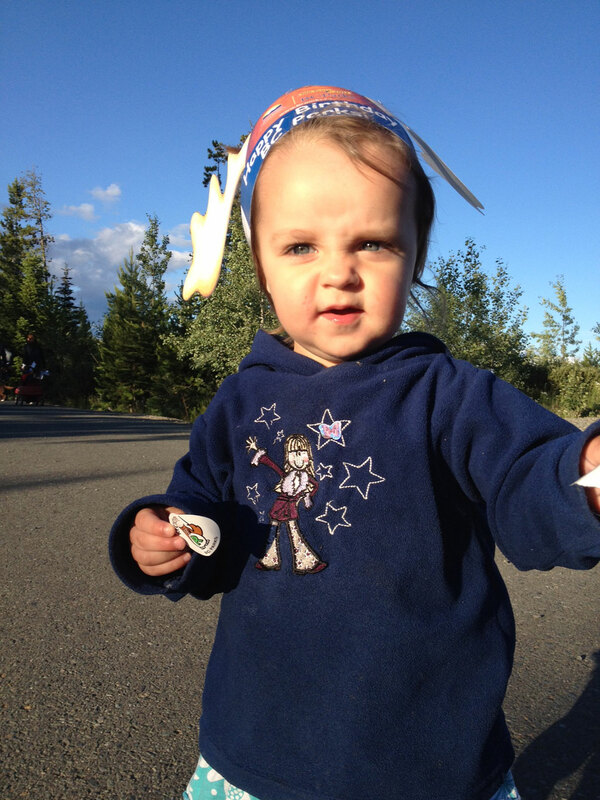 The naturalist talk included a fun hat and park passport for kids, which was a hit with my daughter. 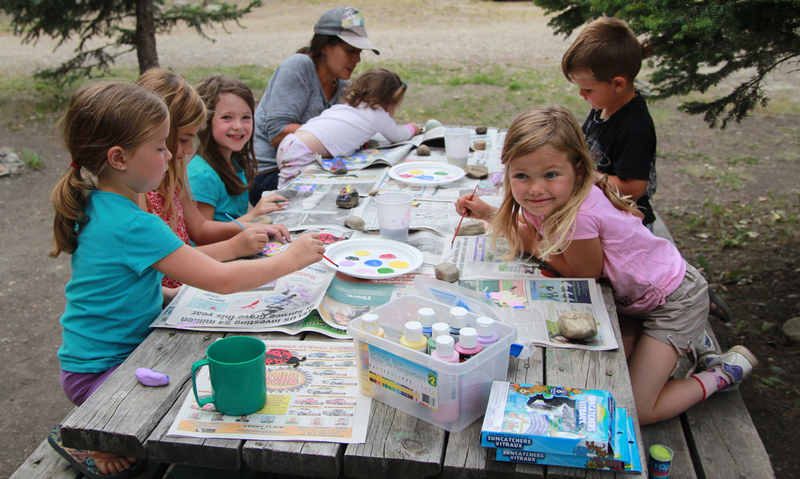 The campground is very clean and well maintained, with lots of large sites. The campground also has a great sandy beach for swimming. I would love to go back with a canoe. 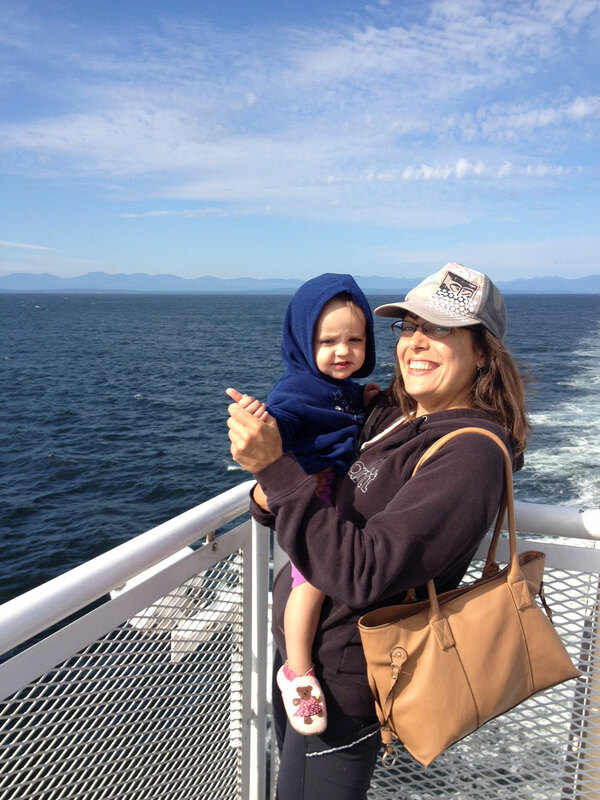 We took BC Ferries between Nanaimo, Vancouver Island and Horseshoe Bay, Vancouver. If you travel on the ferries in the summer or during long weekends throughout the year I recommend making a reservation ahead of time, which guarantees your spot on the ferry for $15-$22. We drove in my hatchback Mazda. I was glad we had air conditioning as some parts of the drive can get really hot in the summer. Note: There is not full cell reception past Revelstoke – make sure you have your directions printed out. I have a nice memory of sitting at the Merritt Husky Travel Centre eating a popsicle – a simple treat that created a few moments of silence and smiles. When kids are starting to get upset or antsy in the vehicle a quick pit stop usually helps! The next day when passing through Revelstoke we spent about an hour at a gas station so I could borrow a phone charger. We sat beside the car and ate an ice cream and I found it quite relaxing to stretch our legs with the fantastic mountain views in the background, and not be rushing. On the return trip we stopped at Bridal Veil Falls Provincial Park, just off the highway between Hope and Chilliwack. We pulled into a fresh fruit stand to get some treats and then drove into the park. We did a short walk to a picnic area, where we snacked in the beautiful and shaded setting. Even in summer it can get cold in the mountains – make sure to pack warm clothes for the evenings. 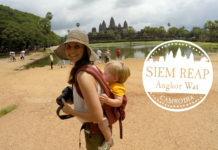 If you are travelling with a young toddler and/or baby I recommend bringing a backpack and stroller if you have room. 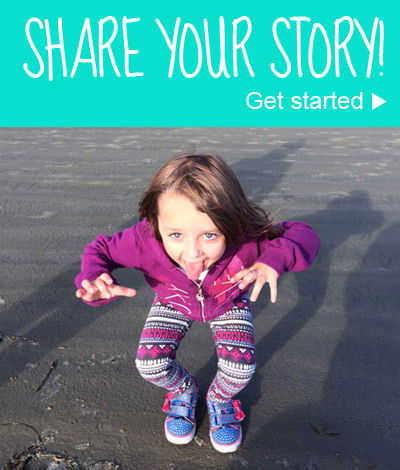 Crafting fun for all ages. 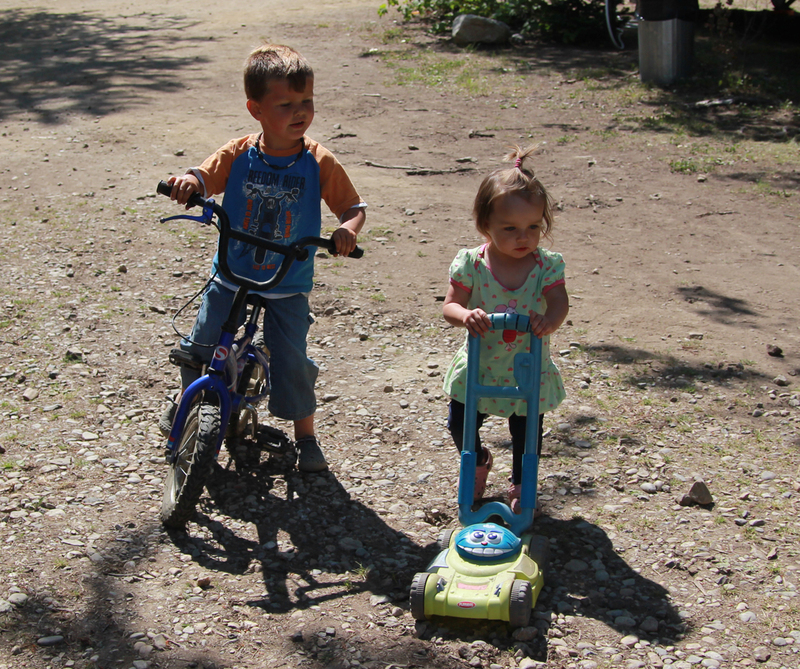 The bikes and toys provided hours of entertainment.